The number of Greater Northern Virginia region homes sold in April was 2,904, a 5.75% increase from April 2008’s total of 2,746 sales. This marks the thirteenth consecutive month of increased year-over-year sales totals for Greater Northern Virginia. The average sales price of $331,600 in April 2009 continues to lag behind the 2008 average by 18.6%. 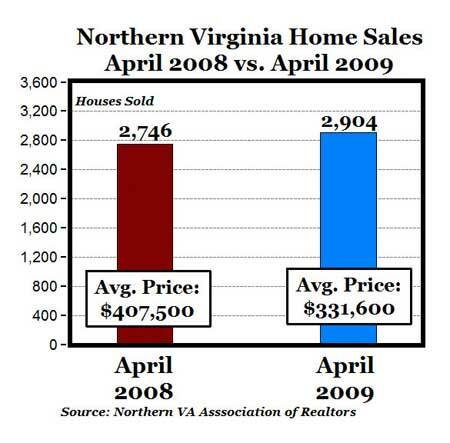 The April 2008 average sales price was $407,500 (see chart above). Across Greater Northern Virginia, the number of listings showed a decrease from 2008 numbers, with 15,683 listings active, which is 33.2% less than this time last year, when 23,471 homes were available. The average number of days on the market (DOM) for a home sold in April 2009 was 89 compared with last year’s 112 DOM, a decrease of 20.5%. MP: Although the average sales price in April ($331,600) was down from a year ago by 18.6%, it was up from the average price in March ($317,158) by 4.55%, which was above February’s average price of $305,000. The $303,000 average price in January 2009 appears to mark the bottom of the market for Northern Virginia, followed by 3 months of increasing average prices. Now with both unit sales (13 consecutive months) and average home prices increasing (three consecutive months), along with reduced marketing time by 23 days, we can probably conclude that the real estate market in Northern Virginia reached a bottom in January 2009 and is now coming back. For some perspective, consider that in April of 2006, the average sales price was $507,585, or 53% above the April 2009 average price.